What makes Taylor & Hart unique compared to other jewellers? Our bespoke design service empowers you to create a more personalised engagement ring than an off-the-shelf piece. Our complimentary design service means there is no commitment to purchase until you love the design. Guided from beginning to end by your personal design consultant, you can be involved in creating something unique that requires your input, just as much as it requires our gemstones, metal and craftsmanship. You can read our full guarantee here. Where is Taylor & Hart located? Our office is based in the City of London, at 27 Clement’s Lane, just a minute walk from Monument underground station or a three minute walk from Bank underground station. We invite you to visit us for a face-to-face consultation, or if you are unable to visit London, we’re able to discuss your requirements over phone, email, Skype or WhatsApp. We do! Please email [email protected] to request access. How does the bespoke process work? Our bespoke design service is what makes Taylor & Hart unique. You’re assigned a personal design consultant, who will bring your ideas to life in the form of a 3D CAD (computer-aided design). Based on your requirements and price point, they will help you select a centre gemstone or diamond. The design can be amended up to three times. A further three amendments will incur a cost of £100 although 95% of customers do not need more than three iterations. Once you’re happy with your design and final quotation, you can go ahead and place your order online. See the full process here. How do I start the process? Once you’re ready, you can browse our site for inspiration and then schedule a consultation or submit an enquiry here. You’ll then be asked to share a little more on your ideas and requirements. You’ll be assigned a personal design consultant who will review your enquiry and get in touch. You can speak with your design consultant via email, phone call or Skype. Alternatively, you can schedule a consultation at our London office to meet with consultant in person, from 9am-6.30pm on weekdays and 10am-5pm on Saturdays. How can I purchase one of your rings? There are two ways to purchase your ring. You can browse through our customisable products online, and once you find a design you like, you can choose your centre gemstone it will be set with. Your personal design consultant will be in touch with you to discuss your gemstone choice and any personalisations you wish to add before you complete your order. Alternatively, you can create an entirely one-of-a-kind ring by speaking with our designers who will work with you to design a custom engagement ring. Whether you’ve seen a design you like elsewhere or you’re looking for some inspiration, your design consultant will offer their insight and guidance throughout the process. How quickly can you create and deliver a bespoke piece? Most designs take between 2-5 days to complete. Once you have approved the final design, we will create and deliver your bespoke-designed ring within 30 days. The exact time frame will be confirmed with you once we know more about your requirements and the complexity of your design. You’ll be updated via email on the status of your ring throughout the process. We do offer an express service, which takes 15 days, for orders needed in less than 30 days, which you can learn more about in the following question. Do you offer an express order service? Yes – for most designs, we can provide a rush order service which will guarantee you receive your ring within 15 days. For collection designs the rush service costs between £120 – £420 for orders being shipped in the UK. Bespoke designs can be quoted on request. Taylor & Hart will always endeavour to deliver on time but cannot guarantee any time-sensitive requests. If you have paid an express delivery fee and we are unable to meet the express deadline agreed upon, we will refund the express fee paid. Please contact [email protected] or 0203 126 4915 to discuss whether your order can be crafted with our rush order service. Can I see my ring before buying? As an online jeweller, we are able to offer exceptional value compared to traditional jewellers by not holding stock and not having the high retail rent costs these jewellers often have. If you’re considering one of our collection designs, you can visit our London showroom to view a replica of your collection design in person. If you want to get an idea of how your bespoke design might look, you can have a resin of your design created. This adds an additional five working days to your design process, but if you’re unsure on the design and have time to play with, we recommend you order the resin to see the design and its scale in person. Can I see my diamond or gemstone before buying? We have over 20,000 diamonds on our diamond search tool that have corresponding photos and videos. We can also contact our suppliers for photos of gemstones. In addition, we purchase our diamonds directly from the polishing companies that cut them, thus cutting out the middlemen, and providing better value to you. If you are able to visit our London showroom, we may be able to show you similar stone options for your reference. We can send you a ‘to-scale’ cubic zirconia in the post to show you how the diamond will look in terms of its size. Can I upgrade my diamond in the future? Yes, we offer customers a range of options for upgrading your diamond to a larger or higher quality stone. Please note that changes in the carat weight, dimensions or shape of your diamond may require an adjustment to the ring setting or full remake and additional fees may apply. Please contact your sales consultant for a personalised quote. For further information, read our Diamond Upgrade Policy. Can you help me keep the engagement ring a surprise? To ensure that your proposal goes to plan, we can contact you discreetly and arrange for rings to be delivered to an alternate address. However, to avoid the risk of fraudulent transactions being made, we ask that you register the alternative address with your credit card provider prior to making a purchase. Your order will be shipped in packaging free from Taylor & Hart branding, ensuring the surprise is all yours. Can I add an engraved inscription to my ring? Yes. Our complimentary engraved inscription is done by hand. If you would like an additional inscription to add detail to other parts of the ring, this can be included in your quote. If an engraved ring has to be resized a second time and then re-engraved, a fee of £115 will apply for the second resize and inscription. Click here for some inscription inspiration. Are there any limits to what you can design and create? We can design and create almost anything – we may sometimes make suggestions on how to ensure your ring stands the test of time and where our production team have specific requirements. Just let us know your ideas and we can create your complimentary design within a few days. Can I use my own diamond or coloured gemstone? Diamonds or coloured gemstones must meet our minimum quality standards. For diamonds, D-I colour, no overtone and 100% eye-clean. Please contact us if you’re unsure of your stone’s quality standards. Can I remove or swap the ruby for another gemstone or diamond? All of our rings come with a complimentary ruby set inside the band. Diamond signature stones are available on request and will incur a higher additional fee, which will be calculated at the time of quotation. Which metals do Taylor & Hart recommend? We work with 18 carat white, yellow and rose gold and 950 platinum. While all our metals are stunning, for a white metal ring, we recommend platinum due to its endurance and natural white colour. All white gold is plated in rhodium to give it a bright white appearance. With normal wear, white gold will need to be replated every 1-2 years to main its original appearance. Can you create a wedding ring that matches or fits next to my engagement ring? Yes! Each of our rings is brought to life from 3D computer assisted drawings of your design. These are then cast into precious metal, any gemstones or diamonds are set, and the ring is hand-finished by our skilled craftspeople. As your engagement ring is finished by hand, there will likely be the subtlest of differences between the 3D CAD and the finished piece, which typically only become evident if you require a wedding ring design which curves or shapes around your engagement ring. A fitted wedding ring curves or slots around your engagement ring. A matching wedding ring is a design that replicates the band width and style of the engagement ring. When you’re ready to order, send or bring your engagement ring to us. We will then take a direct 3D scan of your engagement ring, and use this to craft your wedding ring. As our crafting process takes up to 30 days, we do require your engagement ring for the entire duration. This ensures the fit and match is as perfect as possible. We understand you may not wish to be parted from your engagement ring for this amount of time. While it is possible for us to make your wedding ring without your engagement ring being returned to us, we cannot guarantee an absolutely perfect match or fit against your engagement ring. This process involves 3D printing your wedding ring, using your original engagement ring computer drawing to match. As it’s not possible for us to guarantee perfection using this method, these wedding rings are exempt from our returns policy. On completion of your wedding ring, if you are not happy with the fit or match, it may be possible for the workshop to attempt to achieve a closer fit, for a fee. This will require both rings being sent or brought back to us and the process can take up to three weeks to complete. We do stress that sending back your engagement ring to us is the best way to achieve a fully-flush finish or match. How and where do your rings get made? The design stage take place in London with our very talented consultants who create 3D images and sketches of designs. Once ready to be produced, the design is 3D (wax or resin) printed and then cast into its chosen metal. Our diamonds are primarily sourced from India, the US and Hong Kong. UK and the rest of the world orders are hand-finished in Hatton Garden, London’s historic jewellery quarter. To read more about how our rings are made and our supply chain, visit our ethical engagement rings page. What happens once I've placed my order? At Taylor & Hart, we believe in complete transparency, and so, we wanted to share with you what happens next, now that you’ve placed your order. If your order is an express delivery, then the stages below will be shorter. This is our process for a standard 30-day engagement ring delivery. We prepare the 3D CAD design file for production and send it for 3D wax printing. We purchase the diamond/gemstone and inspect it as part of our quality control process. We cast the 3D printed wax into your chosen metal(s). We clean up the metal components, readying it for assembly and setting. We assemble the different parts via soldering and then set any side gemstones/diamonds, if needed. Master craftsmen hand finish your ring. Polishing, centre diamond setting, engraving (if requested), or finishing touches are completed. We will confirm the expected delivery or collection date at this stage. The final stage is all about quality control and packaging. The ring will be shipped to your designated delivery address. How are the rings packaged? 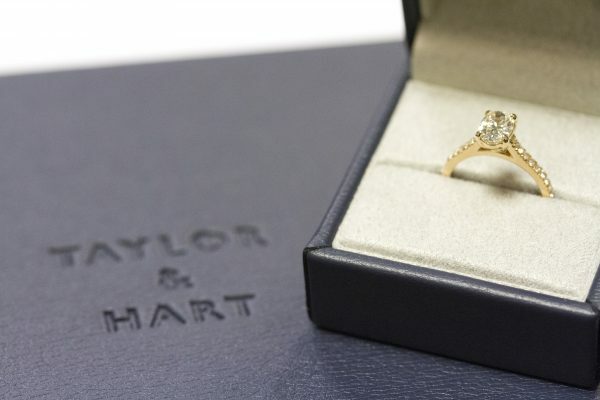 Every Taylor & Hart ring is nestled in our delicate faux leather presentation box within a larger presentation box to ensure your ring is kept safe. We also provide a polishing cloth and small ring pouch which allows the ring to be kept at hand during a proposal. Our shipping packages are free from our branding, ensuring that the surprise is all yours. Where do your diamonds come from? We source diamonds globally from diamond manufacturers that comply with the United Nations Kimberley Process in order to affirm all of our diamonds are ethically sourced. To read more about our ethical sourcing policy, visit our ethical engagement rings page. The 4 Cs represent the four main characteristics of diamonds that are most commonly used to grade and categorise them. They include cut, colour, carat, and clarity. To learn more, please visit out ‘Diamonds Basics‘ guidance page. How can I be sure I am receiving the actual diamond I have paid for? Each of our diamonds come with a unique GIA grading report that is specific to the diamond you have purchased. Each GIA graded diamond is laser inscribed with a serial number on the girdle which can be easily found using a 10x loupe. Should you take this diamond to any jeweller, weigh it or examine it using a 10x magnifying loupe, you will see that the characteristics listed in the report correspond precisely to those of the actual diamond. Visit our GIA graded diamonds guidance page for more information. What types of gemstones and diamonds do you offer? For longevity purposes we recommend diamond, ruby, emerald, sapphire, tourmaline and spinel as centre stones for our engagement rings. We also offer a range of coloured diamonds. Please contact us if you have any questions regarding the prices and availability of any specific kind of gemstone or diamond. Read more about our finance or payment options here. Please note that finance options cannot be used in conjunction with any other promotions. Do your prices change often and how long are quotes valid for? Our prices are regularly updated to reflect changes in exchange rates and metal and diamond/gemstone prices. The price on any finalised quote sent to you by a Taylor & Hart consultant is valid for up to fourteen days. Even so, some diamonds/gemstones quoted may sell out if they are not on-hold and a replacement option may need to be offered in such cases. What is the "starting from" price for bespoke designed pieces? Our bespoke design service starts from £1,300. Can I reclaim VAT on my purchase? If you are a non-EU resident, you can claim VAT back on your purchase. To find out more, visit our VAT refund page. How do I measure my ring size? Knowing your partner’s exact ring size is very rare. If asking them out-right isn’t an option we have numerous ways to find out by following the suggestions from our ring size guide. Our ring size guide should provide you with some options as you must have an approximate ring size before you place your order. What if I need the ring resized? For our UK, US and EU customers, we offer one free ring size with every purchase. For UK & US customers, we kindly ask that you cover the cost of shipping the ring back to us, but we will ship it back to you free of charge. For EU customers, we do require a postage fee to return your ring. Please note that if the ring size change is over two sizes bigger or smaller there may be a fee that needs to be paid for the service as the ring may have to be remade. Visit our Resizing Policy for more information. What if I require a second resizing? For UK and EU customers, this is possible at a fee of £75 and if there is an engraving, re-engraving will cost an additional £40 on top of that. Do I receive updates after I have placed my order? Yes. You will receive updates at several stages of the ring production process which will indicate that your ring is on schedule for your desired delivery date. Please note, you may not receive these emails if your ring is being crafted using our express service. In this case, we ask that you contact your design consultant directly for an update on your ring’s progress. How should I care for my ring? While diamonds and precious metals are not easily damaged, they do require frequent care and maintenance. We have several simple habits that will help avoid damage to your ring and some tips on how to take care of your ring. Can I send my ring in for polishing and cleaning? Yes. As part of our Lifetime Manufacturer Warranty, we recommend that you send your ring back to us for its complimentary annual complimentary clean, polish and inspection. There is a fee for additional cleaning and polishing services within a one-year period. How can I and where should I have my ring insured? For UK customers, we recommend insuring your ring with Worry+Peace. Quote TAYJUNO to get 10% cashback. We will provide you with an appraisal detailing your order, which your insurance provider will likely request. Unfortunately, we do not have an insurance partner in the EU. Of course, we proudly ship worldwide, though to some countries outside of US, UK, EU, Canada and Australia, there may be an additional shipping charge. Are there any shipping fees or taxes that I will have to pay? Orders being delivered outside of the UK, US and EU may be subject to additional duties and taxes and customers are liable for the payment of these. We can attempt to estimate these, but cannot guarantee the estimate will exactly match the cost. Please contact your consultant for further details. How will the parcel be delivered? Orders within the UK are shipped via RoyalMail Special Delivery and most packages will arrive next day. UPS is used for all European shipments outside of the UK. Delivery times vary, so please contact [email protected] to find out more about postal orders to your region. All shipments are fully insured and tracked. The parcel will not feature any Taylor & Hart branding, so there’s no need to worry about the delivery giving away your big surprise. Will the delivery be insured? All shipped orders are fully insured and tracked using Royal Mail and UPS – we have an excellent delivery record with their Special Delivery service. Alternate addresses are acceptable, although we suggest that any credit card order is shipped to the address on file with your credit card company. We can also arrange to have your package shipped to a local Royal Mail depot for collection, though you may be asked to confirm your identity with an approved ID. Once you’ve finalised your design and checked out, you’ll receive your ring in 30 days using our standard delivery service. For most designs, we can provide a rush order service which will guarantee you receive your ring within 15 days. We offer customers the opportunity to return their product within 90 days of their order being delivered. Should you decide to return your item, we will issue you a refund, unless you have been notified otherwise by your consultant prior to your purchase. This is providing it is returned no later than 90 days after the delivery date, in its unworn and original condition without any damage and with all accompanying documents and materials. While we do offer all clients free shipping when delivering your order, we kindly ask you to cover the shipping charge when returning to us. What if I want to return my order and I cannot find the certificate or appraisal? The grading certificate(s) must be returned together with the appraisal and the diamond(s) ordered as these are not possible to replaced. Can I claim back VAT? If you are a non-EU resident and you are able to visit us in our London showroom, you will be able to claim back the VAT upon leaving the country. For full details visit our VAT refunds page.